The Apollo Traveler is an ultra-slim graphene power bank recharged in only 18 minutes. Apollo Traveler can enable USB-C Power Delivery and USB-A Quick Charge 3.0. It supports a 60w input and 45w output, which means it can be recharged & charge almost any iPhone, Android smartphone or MacBook in ultra-fast speed. 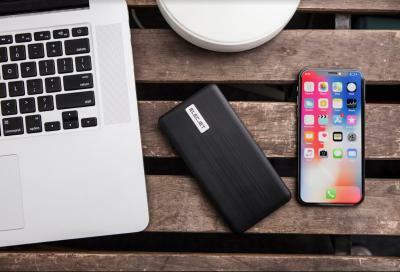 The Company explains that the Apollo Traveler is the first power bank in the world to feature JetSafe technology, which reportedly secures the lowest power conversion loss in the world. With a great charging efficiency of 96%, it reduces the power loss by 10% compared to other standard technologies. Apollo Traveler is also said to be very safe to use, thanks to the graphene material and the unique layout of the batteries that prevent it from any heating dangers. You can recharge it 1000 times, whereas the others can only be used 300-500 times. Elecjet is engaged in the development of core technology, with its focus on the fast charging solutions for smartphones, notebooks and consumer goods. It employs various professionals involved in core graphene composite technology. With the headquarters based in Texas, Elecjet has expanded its footprints to the United States, Canada, United Kingdom, and opened retail stores in Hong Kong, Taiwan, Singapore and other regions.